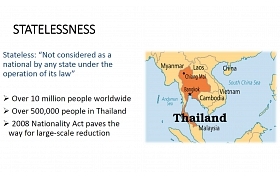 On 13 February, the Institute welcomed authors Laura van Waas and Conny Rijken to discuss the methodology and findings of their two-year research project aimed at understanding the link between statelessness and increased vulnerability to human trafficking amongst the hill tribes in Northern Thailand. The discussion, moderated by Jill Coster van Voorhout of The Hague Institute’s Rule of Law Program, centered on the recent publication “Researching the Nexus between Statelessness and Human Trafficking: The Example of Thailand.” The book examines human trafficking including child trafficking and exploitation under the heading of ACT’s sub-project “Orphan” crimes. Previous research conducted at the Institute and summarised in Policy Brief 10 has focused attention on the challenges of irregular migration which is also relevant to the topics of the new publication. Key concerns raised in the book, and further discussed at the launch, focus on the difference in experiences between citizens and stateless persons as well as men and women and their proneness to being trafficked. The researchers examined subjective legal empowerment in addition to the external and internal root causes (such as poverty, lack of education, or risk-taking behaviour) that can expose an individual to a higher risk of trafficking. Culminating data from a desk review, field and in-depth interviews, surveys and focus groups, and gaining knowledge from a host of experts, the researchers worked with local partner Chiang Mai University Law Clinic to get a perspective of the hill tribes – a mixed population of stateless persons and citizens – based on the experiences of members of these hill tribes. In explaining the research, Laura van Waas touched upon the root factors as “indicative of vulnerability” and pointed to the inclusion of a methodology report in the book as a potential pilot methodology. She hopes this will be useful to follow-up research that seeks to explore the nexus between statelessness and human trafficking in other communities and other parts of the world. The BRICS Development Banks: A Partner for the Post-2015 Agenda?